Next: In 50 years, will global warming have had any positive effects on Americans? Compiled by the Climatic Research Unit at University of East Anglia and Hadley Centre of the UK Meteorological Office. A consensus of scientists have concluded that the Earth’s mean temperature is warming at an alarming rate, drastically threatening the well-being of future generations. In 50 years, will global warming have had any positive effects on Americans? We have one global atmosphere; it is a global commons, and changes that have occurred in its composition and which are projected to occur have potentially dire consequences if planning is not adequate. If we can slow down the development of global warming and at the same time put in place planning for adaptation to the inevitable climate changes that are coming, then it may well have some positive effects. For instance, a warmer climate could allow a longer growing season, which could enable various new crops and activities. Who knows, perhaps in this new climate, a plantation could be cultivated in 30 years instead of 50. Americans may enjoy such things as warmer winters and lower energy demand for heating. Crop and forest productivity may increase in some areas due to increased carbon dioxide in the atmosphere and an extended growing season, but the expected negatives of global warming far outweigh the list of positives. For example, increases in the frequency of heat waves are likely, which would increase the demand for air conditioning. In various parts of the nation, cold weather recreation such as skiing will likely be reduced. A loss of coastal wetlands from sea level rise will likely put coastal communities at a greater risk of storm surges. Reduction in snowpack in the western U.S. will likely alter the timing and amount of water supplies, potentially exacerbating water shortages and conflicts. Continued thawing of permafrost and melting of sea ice in Alaska will likely further damage forests, buildings, roads and coastlines, and harm subsistence livelihoods. There are also likely to be changes that cannot be anticipated at this time. Although most Americans hear about how harmful global warming will be in the next 50 years, it is likely that it will be beneficial, at least to some Americans. For example, it is very likely that farmers will see an increase in productivity associated with the slight warming and increased carbon fertilization over the next 50 years. The timber industry will also see gains as forests are expected to expand and grow faster over this period. Americans living in cool locations (northern or high altitude) will also see some gains in lower heating bills from warming. Most manufacturing industries, however, will hardly be affected by global warming as they are not climate sensitive. How do Fossil Fuels Cause Global Warming? Carbon dioxide absorbs infrared radiation. Most of the energy that escapes Earth’s atmosphere comes in this form, so extra CO2 (from the world’s increasing use of fossil fuels) means more energy absorption and an overall increase in the planet’s temperature. Surface temperature increases are projected to increase 1.8-6.3 degrees Fahrenheit in the next century. However, if carbon dioxide emissions continue to increase at present rates, a quadrupling of pre-industrial CO2 concentration will occur not long after the year 2100. 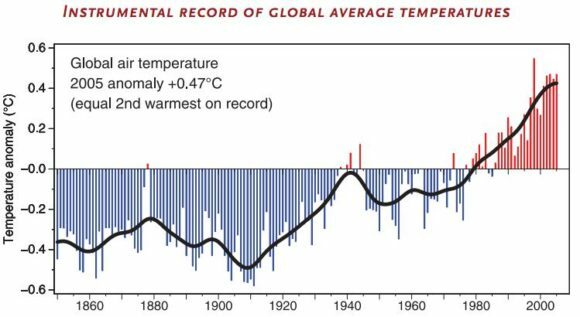 Projected temperature increases for such an atmospheric concentration are 15-20 degrees Fahrenheit above the present day mean annual global surface temperature.